Decided to begin the camping season as early as possible this year. 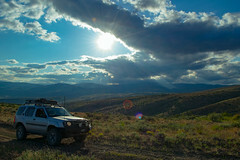 So my buddy Dana and I headed towards the Colockum Wildlife area to do some exploring and to find a suitable campground. We had ventured out this way in late February but were stopped a short way into the area by decent snow drifts at about 4000 feet elevation. This time, just a little over a month later, we made it further, but not by much. (FYI: There is a full video (still in post-processing stage) of the Perkins Road portion of this trip at the bottom of the page). Following Parke Creek road vaguely northward we were again thwarted by deep snow drifts near where Parke Creek road intersects with Caribou Road. The weather turned out to be absolutely fabulous; Mid 70’s with a 8 mph wind. In the higher elevations the wind was brisk enough to keep us from setting up camp as we knew it would get very cold, very quickly, once the sun settled behind the mountains. Seeking lower elevations with some wind breaks we headed east on Perkins road. Let me say that this is an amazing trail, not for the trail conditions but for the views. As one heads east one is rewarded with views of the Columbia river gorge and sweeping vistas of eastern Washington. If one is lucky, one might also cross paths with one of the immense elk herds that roam the area. Our good fortune lead us by a herd that apparently numbered well over 80 elk. We ran across several Elk herds of various sizes all weekend. Continuing east on Perkins road, which becomes more and more primitive and rough as one follows it , we ventured along the ridge line as it undulated up and down the hills. You think you may reached the end of the trail as you top a hill only to see the dirt track stretch out before you even further. Along the way I spotted a bright pink hue in the brush off the trail. Stopping to investigate, I found several Hedgehog cactus that were just beginning to bloom. I had no idea we had cactus in Washington state so this was a nice surprise. Finally reaching the end of the ridge the trail turns south, down a steep switchback with large, loose, sharp volcanic rock making up most of the roadbed to a idealistic looking valley below, with the small pond and green grass, a perfect looking campground. Unfortunately, at this point we had little choice but to turn around as we couldn’t make it past an abandoned, beat up Land Rover was blocking the road. Apparently, it had popped a rear tire as it was coming up this switchback and the owner just left it there. Simply walked away. The tags were expired in mid 2015 so it was likely this vehicle had been sitting there for quite some time. I, for one, would not want to try to change a tire on a steep switchback with all of a foot of space between the vehicle and a 300 foot drop off to do the work. So I understood the temptation to just leave your vehicle, not that I would ever do such a thing. Hopefully, the owner made it home safely. It was a somber reminder that venturing into the backcountry can be perilous. It requires one to be prepared to handle most any breakdown or emergency on ones own because help will not come quickly, if at all, if you get into a tricky situation. It was getting later in the day and we needed to find a camp site soon. As we drove west back up Perkins road the sun was sinking lower and lower, finally positioning itself directly in line with the trail, thereby blinding us. Several times we had to scout on foot to see where the trail ahead actually was. There was just one viable trail that led down the north side of the ridge we were on, so we followed that, hoping to hit upon someplace large enough for two vehicles plus roof top tent and a large ground tent. This trail was more of a ATV trail than a full sized vehicle one but we followed it down anyway. This part of the trail was fairly perilous; steep, very rocky, with a three foot deep drainage ditch from the winter melt down the middle that required us to perch our tires on each side. Very little room for maneuvering. Perhaps not surprisingly, we saw another abandoned vehicle. This time it was a very old Ford pickup that looked like it had rolled down the side off this trail back in the 70’s. It was very rusted and riddled with bullet holes. Once we creeped to the bottom we then followed Little Bushy Creek as it made its way to the east. We could see on the maps that this creek connected with another further down so we were hoping it would be a decent place to call home for the night, as it looked like a small flat valley. What we encountered was beyond our hopes. As we got to the junction of the two creeks we found a wide, grassy valley with a few camping spots ready for us. Fire-rings already in place, several trees, a small burbling stream – we were home. Just in time since the sun was about to recede behind the mountains and the light would be quickly dimming. We set about pitching camp, Dana with his CVT roof top tent and myself with a 9-person ground tent that was gifted to me by an acquaintance. It seemed like just a few minutes after we finished setting up the tents it was pitch dark in this little valley. We stoked a fire and Dana began making the best camp dinner I have ever had: Mac n cheese with spiced hamburger, cooked in a dutch oven over the BBQ grill that he had brought along. Typically, I take the easy route when it comes to eating on the trails. Mountain House freeze dried meals are easy to make, lightweight, and plenty tasty. Dana showed me that you can make a fantastic meal with just a little preparation and it is far and away so much better than a freeze dried, reconstituted dinner. After the meal and a few beers I set up my astrophotography gear to capture what I could of the Milky Way Galaxy and some camp shots. (The Milky Way galaxy shots are forthcoming, once the post-processing is finished). The next day we explored a bit of the ridge to the north, following along Brushy road. Eventually we had to turn around and return the way we came as Brushy road heads into protected land for the wintering Elk. We returned up Perkins Road to Parke Creek road and headed back to civilization. We measured the distance we had traveled by trail over the weekend and it added up to about 73 miles, which is a stunning amount for one weekend in one relatively small area. The high plains deserts of central eastern Washington are quickly becoming some of my most favorite territory to explore.